Trenton, N.J. – The staff and students of Mercer County Community College’s (MCCC's) James Kerney Campus (JKC) invite community members to an annual tribute to Dr. Martin Luther King Jr. on Monday, January 18 from 2 p.m. to 4 p.m. The event will be held in Kerney Hall (KC 229). The Kerney Campus is located in downtown Trenton at 102 North Broad Street. This year’s theme is “Change Your Thoughts; Change Your Life.” A panel discussion will be led by Trenton businessman Tracey D. Syphax, Trenton community activist Darren “Freedom” Green, Attorney Helen Higginbotham, and Bishop Gary Mullins, of Mt. Bethel Church of God. MCCC's Youth College students will read original poems and essays. (Youth College is an MCCC-based enrichment program for Trenton area teens.) 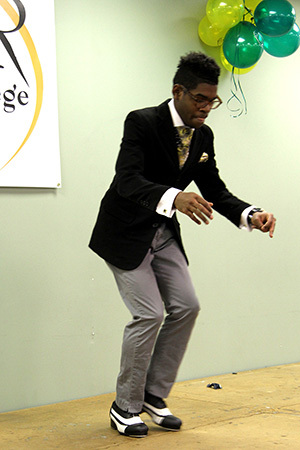 The program also features tap dance by Quenten Couch, who is studying dance at MCCC. Couch performed at Newark's Symphony Hall in 2015 in a show choreographed by Maurice Chestnut. The ceremony will be hosted by MCCC Professor of Communication Alvyn Haywood, and is free and open to the public. For more information, call 609-570-3188. Quenten Couch, who performed in 2015, will be featured again this year.